At the core of Hydraredox’s technology is a proprietary ‘single cell’ design in which each cell operates independently. The key operation parameters of each cell — voltage, electrolyte flow, state of charge (SOC) and current distribution within the cell — are monitored and controlled electronically. Together with several other innovations, this design confers the system unique characteristics and advantages: complete customization, high efficiency, long life, safe operation and full compatibility with renewable energy sources. 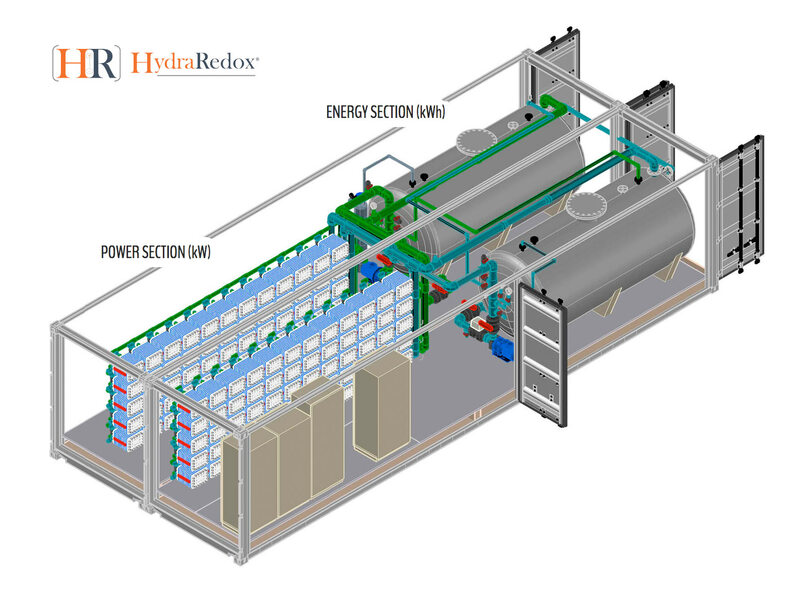 The HydraRedox system is composed of two independent sections: power and energy. The power section is composed of individual electrochemical cells connected electrically in series which transform electrical energy into electrochemical energy (charge), and subsequently re-transforms it into electrical energy (discharge). The power required is achieved using a modular system of cells. The system is scalable up to multi-MW, making it ideal for large-scale applications. The energy section consists of tanks in which the energy is stored in electrochemical form in an aqueous solution, the electrolyte. The energy can be stored for the amount of time required (kWh) ranging from a few minutes to over 24 hours. This widens the range of applications and makes the system ideal for long duration storage. The HydraRedox system can be customized not only in terms of energy and power but also in terms of voltage and amperage. The flexible architecture allows complete freedom of design and makes it suitable for a multitude of applications. The system can be charged/discharged at up to 4 times nominal power to accommodate peak periods – and can therefore be sized with a power significantly lower than peak power. HydraRedox can be charged from continuous or intermittent sources without suffering deterioration. The HydraRedox system displays high efficiency levels. The roundtrip efficiency is above 85% at rated load, and increases for lower loads – a unique feature which makes the system highly suitable for use in conjunction with renewable sources of power. Unlike many other batteries, the system does not suffer any self-discharge even when idle during long periods of time. The system has immediate wake up i.e. it can be operative in a fraction of a second, making it suitable for back up. The projected life of the system is ~30 years in line with that of renewables. This is possible thanks to the unique design of the system which does not suffer the deterioration through cycling typical of other batteries. The ease of maintenance while in operation also prolongs the life of the system. Renewables require a storage solution as environmentally neutral as they are. HydraRedox is the perfect partner: clean, efficient, with a long life. The system does not generate emissions and operates safely at ambient temperature and atmospheric pressure. At the end of its life, the system can be dismantled without environmental impact and the electrolyte, in which the energy is stored, is entirely recyclable. HydraRedox systems are designed to lower all costs: production, operation and maintenance, and disposal. Proprietary design lowers operation and maintenance costs and eliminates safety concerns associated with other batteries. HydraRedox has received funding from the European Union under the Horizon 2020 research and innovation programme for SME Institutions: Stimulating the innovation potential of SMEs for a low carbon and efficient energy system. The two-year project entitled ‘ A reliable, efficient, flexible and cost-effective vanadium-redox battery technology for large scale electricity storage: a novel solution for a green grid’ – is focused on the optimization and scalability of HydraRedox’s technology. The CDTi has granted HYDRAREDOX IBERIA, S.L. a subsidy under the NEOTEC Programme. The NEOTEC Programme aims to support the creation and consolidation of technology-based companies. The two-year project is aimed at the optimization and installation of a plant to produce the electrolyte, and the installation and optimization of the assembly plant for the electrochemical cells.